According to mythology, the titan ('asura') Mahisha gained such enormous power through the performance of penance that he threatened the stability of the world. The gods, becoming increasingly helpless against him, begged assistance from the goddess Durga and armed her with their combined energies, weapons and powers. Thus empowered, Durga attacked and vanquished the buffalo-headed 'asura'. In this impressive, early representation, Durga attacks Mahisha and with one foot on his neck spears his bovine body with her trident. Durga’s lion mount ('vahana') aids her by attacking Mahisha’s haunches. The goddess, beautiful and serene, maintains an almost detached calm that belies the enormous drama and significance of her triumph. 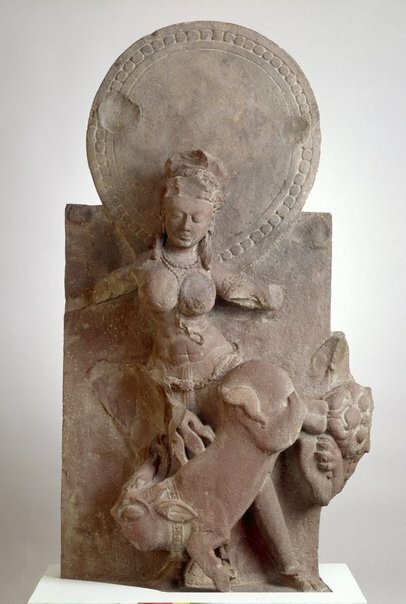 Although the goddess appears as an invincible Amazonian warrior, to her worshippers Durga is a maternal deity, a mother-goddess and protector of her devotees. The Asian Collections, AGNSW, 2003, pg. 22. Olivia Prunster, Look , 'Following th puja dancers', pg. 13-14, Sydney, Feb 2006, 15 (colour illus.). The Asian Collections Art Gallery of New South Wales , 'The Realm of the Hindu Gods', Sydney, 2003, 22, 23 (colour illus.). Look , 'Years of enrichment', pg. 12-15, Sydney, May 2009, 13 (colour illus. ).